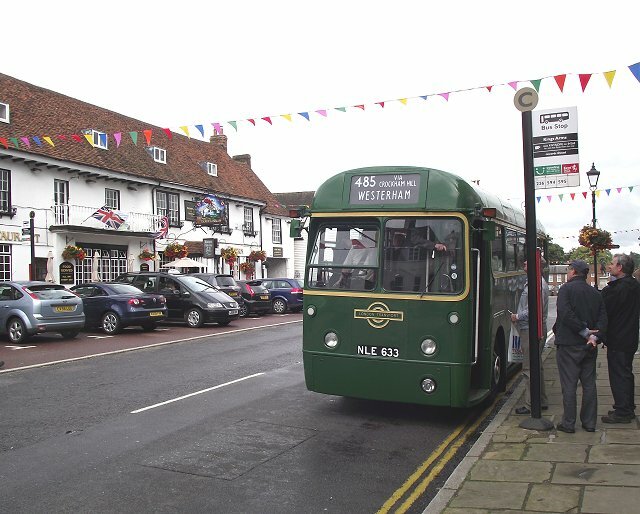 We stood a little on the bus stand outside the Star in Edenbridge. Then we were away, up through the narrow street with its pub sign stretching across above the traffic. 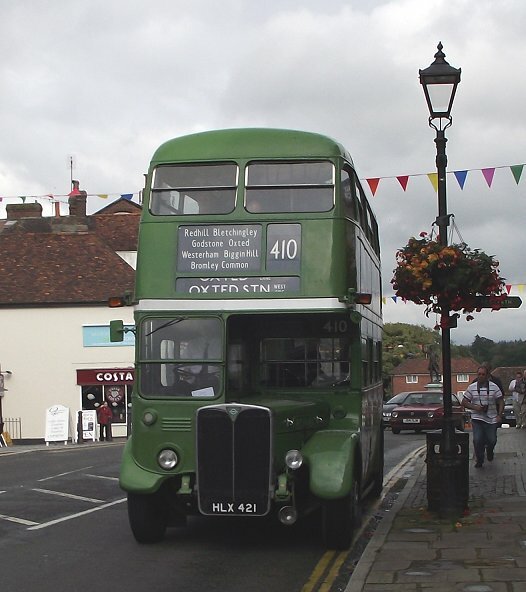 We went on up the hill, rejoining the main road that bypasses the main street, and ignoring Edenbridge Town Station in its cul-de-sac. 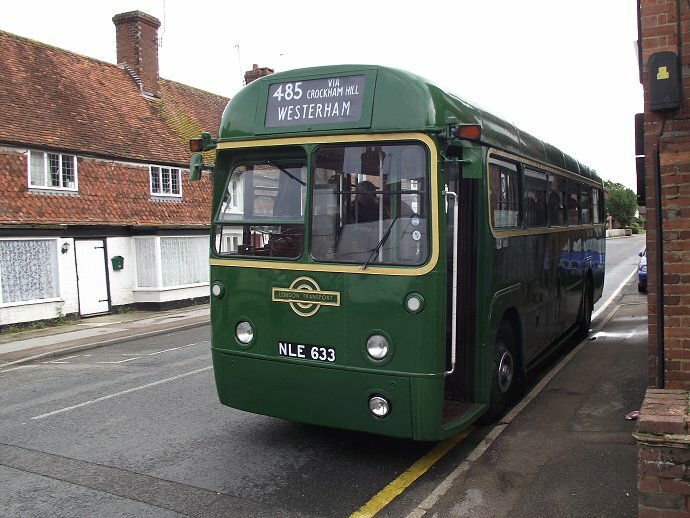 We climbed steadily on, up under the two railway bridges and increasingly steeply up to Crockham Hill. There we turned off onto the Westerham Road, and wound on up through the woods onto Hosey Common, then down the other side to Westerham. We pulled up outside The Kings Arms, where I alighted. RF633 went off towards the Croydon Road to turn, and then suddenly it was connection time in Westerham. Go-Coach Optare Solo YJ59GFG emerged from London Road on the 401 to Tunbridge Wells, and GS2 arrive on a 465 from Oxted via Crockham Hill. 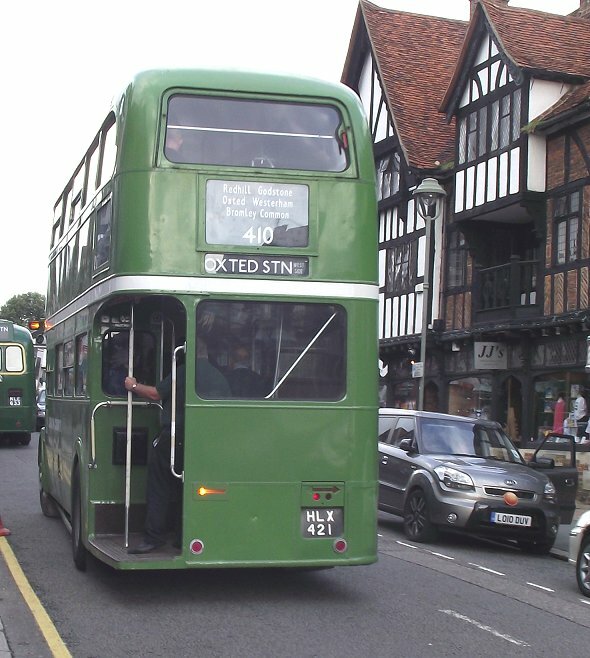 GS2 went off to turn in Croydon Road, and RF633 returned to pull up outside The George and Dragon, ready to work the third side of the star-shaped working - the 464 - back to Oxted. 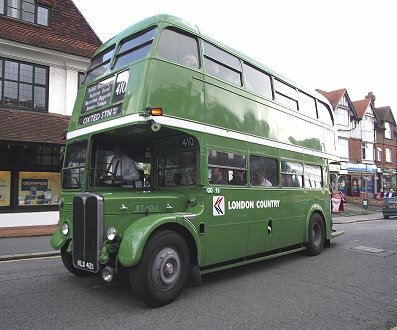 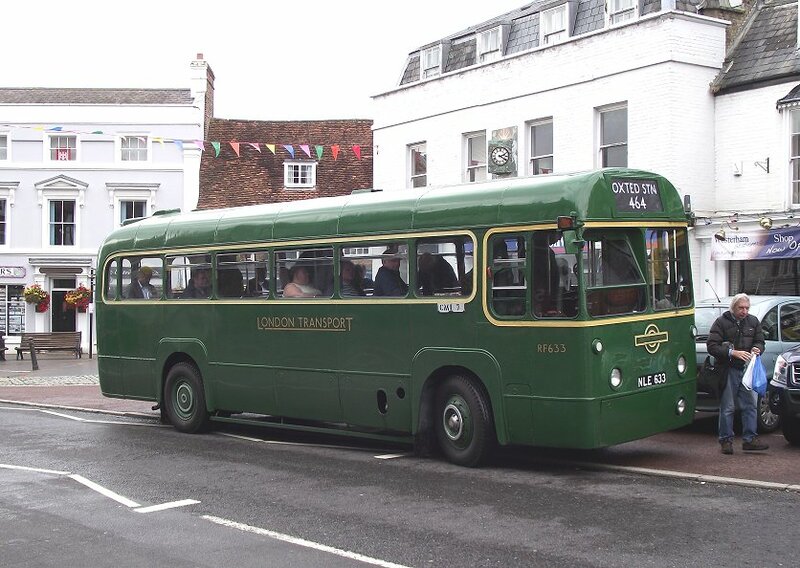 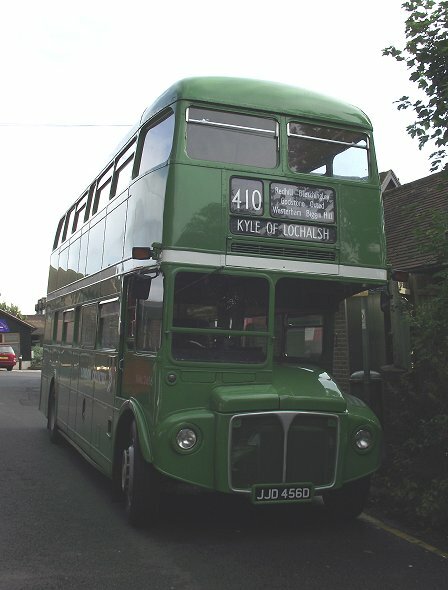 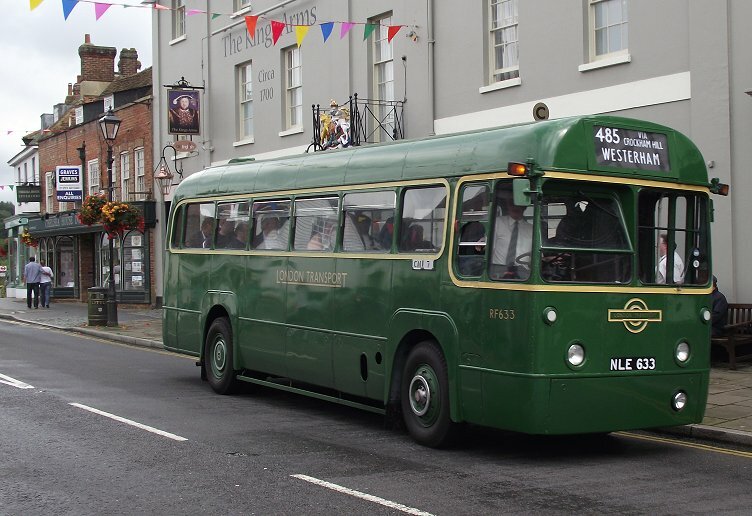 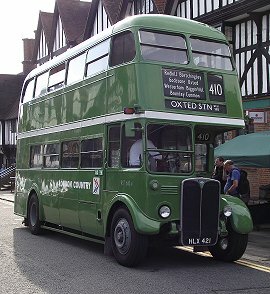 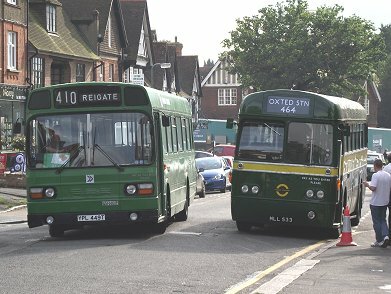 Then RT604 came round the corner from London Road, to pull up at The Kings Arms on a 410 to Oxted. 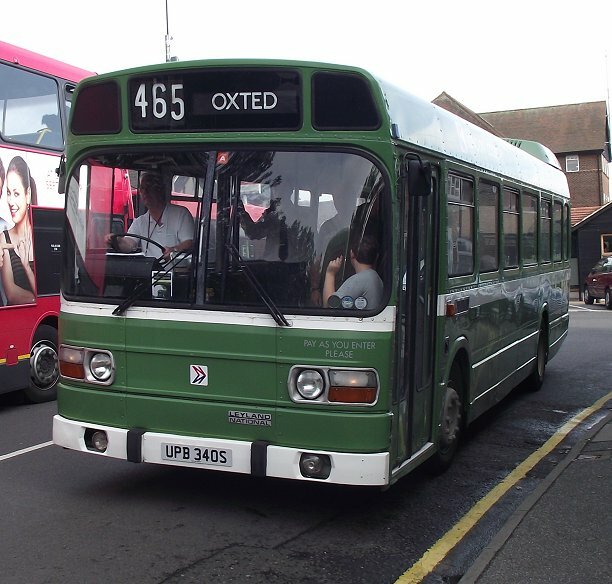 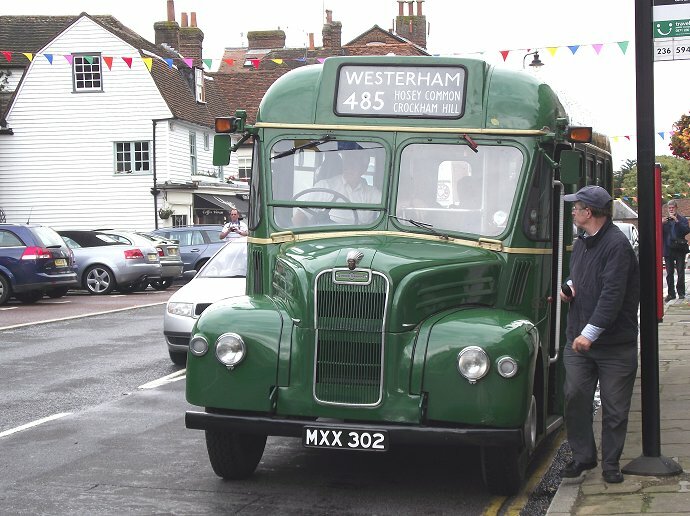 I climbed aboard RT604 for the ride back to Oxted. 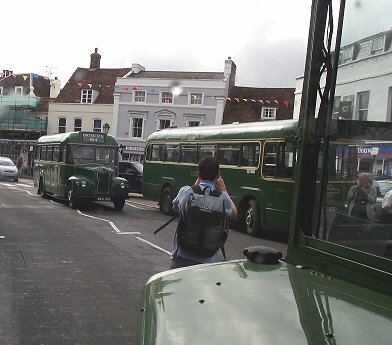 As usual most perople headed upstairs, so I was able to get the seat behind the bonnet. 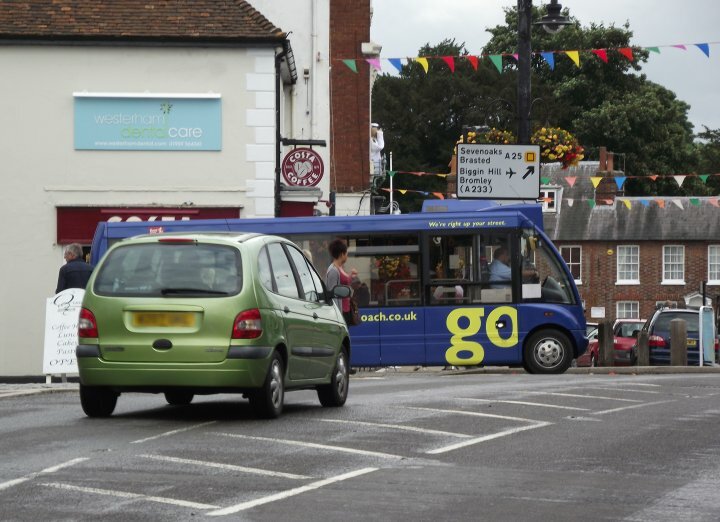 Then GS2 arrived back. So there was RT604, GS2 and RF633 all together, just for a few moments. We set off along the main road for the short direct journey to Oxted, up the dry valley (dry except for rain). 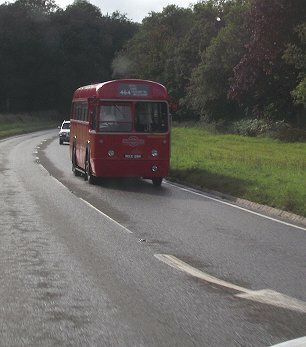 We met RF406 hurrying down the gradient, on its way home. 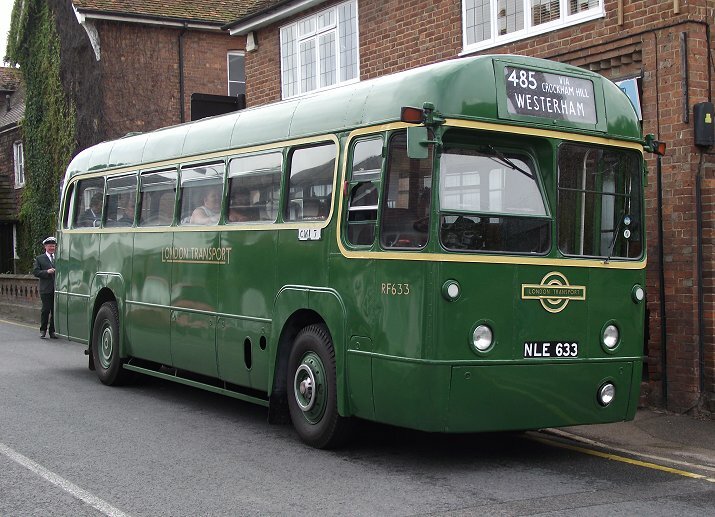 We crossed the heights of Limpsfield Common and plunged down into Oxted, passing round by the Station East Side and under the bridge to reach the West Side. 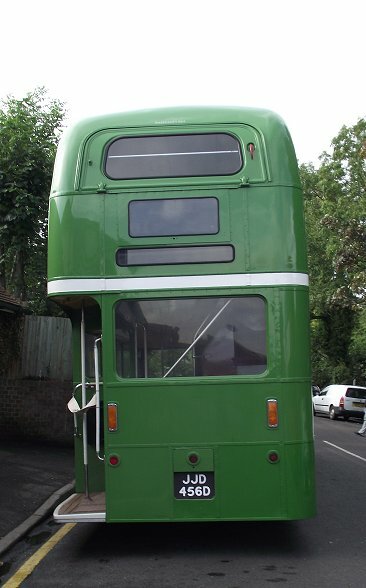 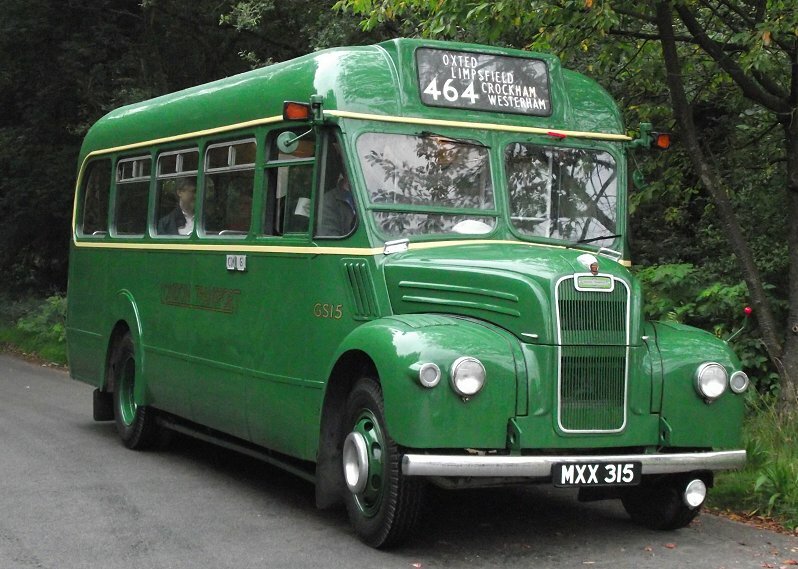 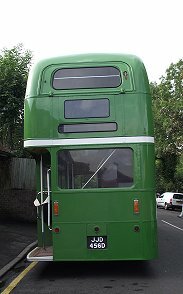 I walked round the corner to look at my expected next ride, RML2456 in NBC green and white, which suits it well. 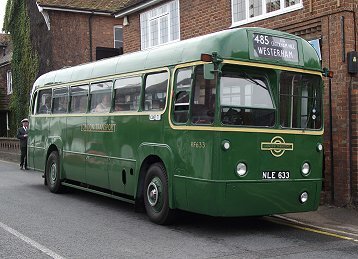 But I had half an hour until the 410 westwards, with no further outward return trips schedukled, so I went to see what was happening and say thank you to a few people for this fascinating day. SNB340, arriving from a Tandridge trip on the late form of the 465 journeys, came round the corner by the station and squeezed past DOE28. Round on Station Approach SNB449 was coming in on the next 410 from Westerham, past RF146, which was sidelined with a diesel injector leak. 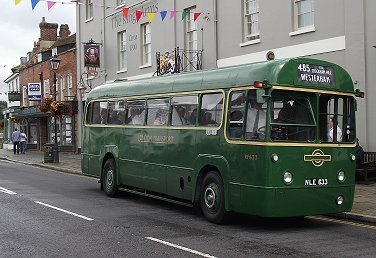 Fortunately John Huxford, arriving with GS2, had a spare injector pipe and tools with him, and could fix it on the spot. Meanwhile RT604 had run an extra to Godstone Green and back.